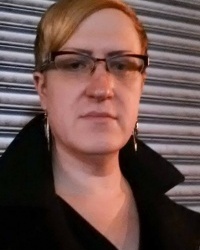 TRACE PETERSON is a trans woman poet critic. Author of Since I Moved In and numerous chapbooks, she is also Editor/Publisher of EOAGH and Co-editor of Troubling the Line. Her scholarly and creative writing have recently appeared in TSQ: Transgender Studies Quarterly, the Ashbery Home School Gallery, and the “Genre Queer” issue of Cream City Review. She currently serves on the Board of Directors for VIDA: Women in Literary Arts and teaches the first-ever course in Transgender Poetry at Hunter College.